Sorry for the delay on these. They came out Tuesday (much earlier than expected!) and I've been sick. At least Upstate, the special master's proposals look more coherent to me than the various proposals from the legislature. 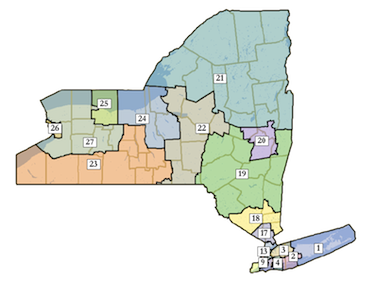 Special Master's Congressional districts map, New York State. The map comes from these maps produced in this case. (They're on line 184.) These aren't necessarily final lines - the courts could still change them, or the legislature could suddenly reach its own compromise. Tompkins County would become part of a district extending along the Southern Tier to Jamestown, with Tom Reed (R) of Corning as its likely incumbent. While I'm sure One of Nine would be excited to have a right-wing Republican as its Congressional representative, I suspect much of the rest of Tompkins County would be a lot less happy. It would be kind of an "ends against the middle" district, with Tompkins as the only decisively Democratic county, Chautauqua as the only closely divided county, and the rest (especially Steuben, where I grew up) running very Republican. Steuben by itself has 15,000 more Republicans than Democrats, while Tompkins has about 10,000 more Democrats than Republicans.